Mark Webber likes to remind us, just from time to from, that he's a contender. Just as in Japan, from an early point of the weekend Sebastian Vettel looked the guy to beat in Korea, and it continued to look that way in qualifying. 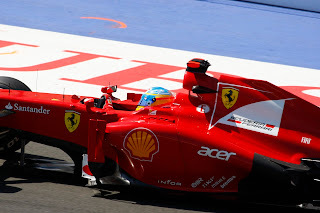 And presumably it would all be a prelude to him bossing the race out front as we've seen from him countless times. This remained the case right up until the final, vital qualifying run, that's when Seb was reminded that for all of the RB8's improvements in recent times he has opposition in residence. 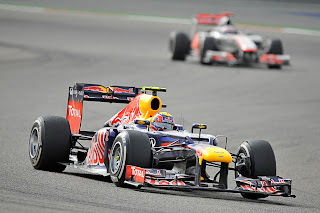 Webber put the thing on its nose and sneaked under Vettel's time. Vettel, behind him, didn't get it right in the first two sectors of his final lap, thus ensuring that the Red Bull front row lock-out perhaps unusually features Aussie Grit ahead. 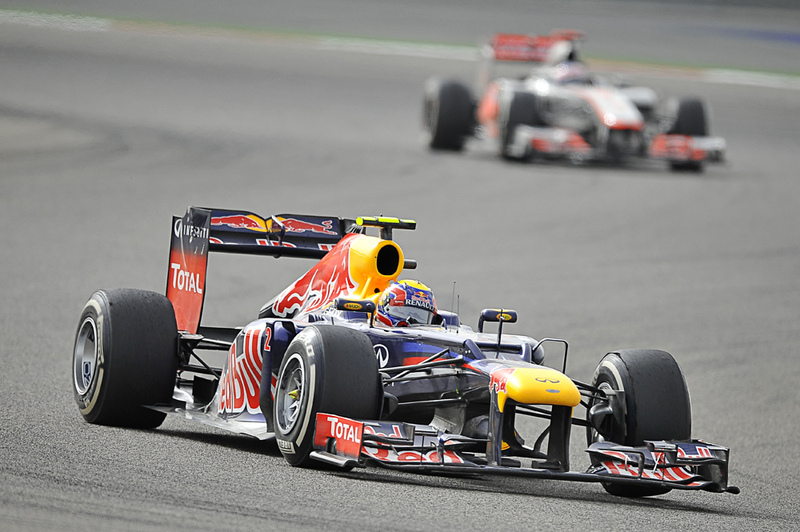 Is Mark Webber as good as the likes of Fernando Alonso, Lewis Hamilton, or his team mate Vettel? Ultimately, probably not. But he's certainly capable of living with them, keeping them honest, and on many days of plain beating them. Today was one such day. And on the evidence of the Yeongam running so far, while the Bulls again start at the front they likely won't be running away as they did in Japan. The opposition looks close, and presumably will come on stronger on race day. What's more the grid is fascinatingly poised. Lewis Hamilton bounced back from his Suzuka troubles (form is temporary, class is permanent as they say) to qualify third, and one Fernando Alonso sits fourth, the F2012 indeed looking much closer to the pace than at this point of the weekend in Japan. Then comes Kimi Raikkonen and an apparently-rejuvenated Felipe Massa. Red Bull must feel a little in the firing line. Jenson Button got it wrong in the second qualifying session, befuddled by a late yellow flag, and starts 11th. But with strong race pace, tyres in hand and strategy flexibility on offer from starting outside the top ten you'd expect him to trend upwards in the lap charts too. Seb, as you'd expect, wasn't pleased at missing out on the pole, and the plan on doing his usual party trick of dominating a race from the front has thus been compromised (though last year here he also qualified second and was leading by turn four, and controlled things as he liked from there). If the Red Bull team management were being completely candid they'd probably admit that they would rather Vettel won the race than Webber, given he’s much better-placed in the title hunt. But Webber you feel still hasn't given up on a title chance of his own (however remote it is). At some point tomorrow the pitwall may therefore have a decision to make, especially if the Bulls are at the front with Webber ahead late on. Christian Horner has however been a rather vociferous critic of team orders in the past, meaning the team could be hoist on his own petard a little. If the team does affect a ‘switch’ it’ll need to be subtle about it. But that would be a nice problem for the team to have, because as mentioned there will be plenty of opposition in exile tomorrow too. The Ferraris and McLarens looked strong in longer, race-simulation, runs in practice (possibly stronger than the Bulls), and Lewis will not hold anything back in giving his title bid a timely adrenaline shot. Then there's Alonso, who as we know cannot be completely ruled out of anything until he's on the plane back to Oviedo. He'll be at his tenacious best tomorrow presumably, though will be more wary than most of first corner accidents. But let's not forget that the Red Bulls can hardly be counted out either. Once their cars are at the front of a race it can be extremely difficult to dislodge them. I suspect that tomorrow will be a case of similar. Thus a grid magnificently set, a number of cars close on pace, and a race that could well be pivotal to the destination of title honours this year. You couldn't really ask for any more could you?